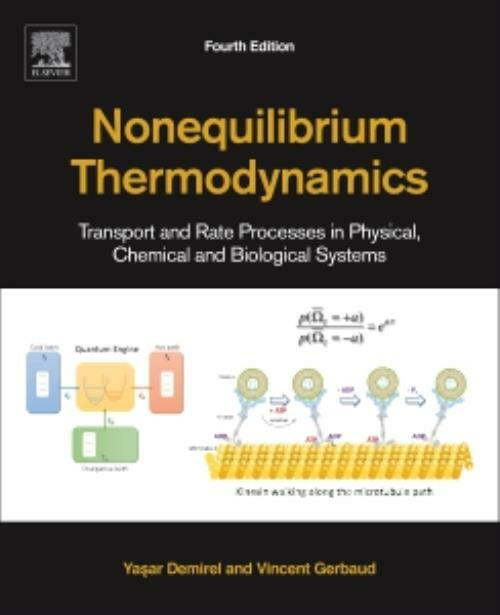 Nonequilibrium Thermodynamics: Transport and Rate Processes in Physical, Chemical and Biological Systems, Fourth Edition emphasizes the unifying role of thermodynamics in analyzing natural phenomena. This updated edition expands on the third edition by focusing on the general balance equations for coupled processes of physical, chemical and biological systems. Updates include stochastic approaches, self-organization criticality, ecosystems, mesoscopic thermodynamics, constructual law, quantum thermodynamics, fluctuation theory, information theory, and modeling the coupled biochemical systems. The book also emphasizes nonequilibrium thermodynamics tools, such as fluctuation theories, mesoscopic thermodynamic analysis, information theories, and quantum thermodynamics in describing and designing small scale systems. Dr. Yasar Demirel earned his PhD degree in Chemical Engineering from the University of Birmingham, UK in 1981. He joined the faculty of Çukurova University in Adana, Turkey, and promoted to associate professorship in 1986. In 1993, he joined the faculty of King Fahd University of Petroleum and Minerals in Dhahran Saudi Arabia where he was promoted to full professorship in 2000. He carried out research and scholarly work at the University of Delaware between 1999 and 2001. He worked at Virginia Tech in Blacksburg as a visiting professor between 2002 and 2006. Currently, he is on the faculty of University of Nebraska, Lincoln. He has accumulated broad teaching and research experience over the years in diverse fields of engineering. He is the editor-in-chief of the International Journal of Thermodynamics. Dr. Demirel authored and co-authored three books, four book chapters, and 160 research papers. The first edition of Nonequilibrium Thermodynamics was published in 2002. After it was expanded to a graduate textbook, the third edition was published in 2014. The second edition new book titled "Energy: Production, Conversion, Storage, Conservation, and Coupling is published in 2016. He has obtained several awards and scholarships, and presented invited seminars. Dr. Vincent Gerbaud obtained a MSc in Chemical Engineering in 1992 from UMASS, USA and earned his PhD degree in Chemical Engineering in 1996 from the Institut National Polytechnique de Toulouse, France. He joined the French National Scientific Research Center CNRS at Laboratoire de Génie Chimique in Toulouse in 1998 where was promoted research director in 2012. He is the Head of the French GDR CNRS Thermodynamic group since 2014. His research field concerns modelling and simulation in process system engineering with a special focus on bridging molecular scales to macro and mega scales systems. With the help of model-driven engineering concepts, nonequilibrium thermodynamic principles of self-organization and Edgar Morin's theory of "la pensée complexe", he addresses with a holistic approach the modelling of complex systems in areas related to engineering connected with macro economy, environmental and social sciences. Dr. Gerbaud co-authored 6 book chapters, 80 research papers and his work led to 6 specialized software. He has contributed to promote innovative teaching and learning in engineering classes based on activities of e-learning, writing reflective portfolio and designing mind maps among others tools.